At a presentation ceremony on Friday 16th March 2018, Professor Rami Abboud was formally elected Honorary Fellow (ad hominem) of the Royal College of Surgeons of Edinburgh (RCSEd), Britain's oldest surgical royal college . Established in 1505, and with a worldwide membership, the Royal College of Surgeons of Edinburgh is the oldest and one of the largest surgical establishments dedicated to the pursuit of excellence and advancement in surgical and dental practice, through its activities in education, training and examinations. It is extremely rare for the Fellowship (ad hominem) to be presented to a non-medic/non-surgeon such as Professor Abboud. The honour is given to those who are deemed by the College to have achieved distinction in their professional field and rendered special service to the “art and science of surgery”. The fellowship, the most prestigious award the College offers, was presented by College President, Professor Michael Lavelle-Jones with Professor Bob Steele giving the formal address (see video below). Left: Professor Abboud receiving his fellowship from the President of the RCSEd, Professor Michael Lavelle-Jones; Right: Professor Abboud with his wife, Dorin, son, Rami, and his sister, Nicole, and mother, Amale, who flew in from Lebanon especially for the ceremony. “I am delighted and honoured to receive this prestigious fellowship from the Royal College of Surgeons of Edinburgh,” said Professor Abboud. “On a personal level it affirms and validates the work and research I have done over the last 25 years at the University of Dundee. It also reinforces the University of Dundee and the School of Medicine’s reputation as one of the leading institutions for teaching, research and training in Orthopaedic & Trauma Surgery, Biomechanics and Motion Analysis. The latter would not have been possible without the unconditional and loyal support of the dedicated staff at the TORT Centre, Medical School and my NHS colleagues at Ninewells Hospital and from around the UK. The event became even sweeter when my wife Dorin was asked to come onto the stage, a total surprise organised by the College President, to formally award her with her FRCSEd (Gen.Surg) that she completed in 2006 but never attended graduation. Left: Professor Rami Abboud, Professor Michael Lavelle-Jones, Miss Dorin Ziyaie and Professor Bob Steele; Right: Professor Abboud with his proud mother and sister. Professor Abboud’s dedication towards teaching, research and training was also previously recognised with the award of Honorary Fellow (FRCS), of the Royal College of Surgeons of England, which was formally recognised at the College’s Awards Ceremony on 18th January 2012. So being presented with this latest fellowship will most likely make Rami the only non-medically qualified individual in the world to have received both College’s most prestigious awards. 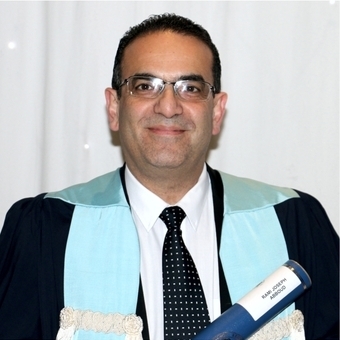 Professor Abboud is Director of the Institute of Motion Analysis and Research (IMAR), Head of the Department of Orthopaedic & Trauma Surgery, Director of the Master of Orthopaedic Surgery (MCh Orth) Course, Head of Postgraduate Division and Associate Dean for Learning and Teaching at the School of Medicine at the University of Dundee.